The GO-STRAP is designed to carry the load of injured soft tissue. It is indicated for use in the treatment of tennis or golf elbow (Lateral or Medial Epicondylitis). The remarkable advantage of the GO-STRAP to the user is the ability to unload the injured soft tissue of the supinator, extensor muscles and Common Extensor Tendon so as to release their tension. This is what many therapists do with sports taping even though it is not convenient long term, and no other strap approaches this unique design problem like the GO-STRAP. The simple but effective design provides firm support in a large range of elbow positions using the advantages of the proven 'anchor' and 'tie' approach. The support is comfortable and flexible, in contrast to the disadvantages of skin irritation and elbow restriction which are the main problems with rigid sports tape. This amazing innovation provides instant support! Inappropriate or prolonged incorrect use, sizing or fitting may result in adverse effects. Read "Terms and Conditions" before using. Seek medical advice if pain or symptoms persist. USE ONLY ON THE RECOMMENDATION AND SUPERVISION OF A QUALIFIED HEALTH CARE PROFESSIONAL. The circumferential strap acts as an 'anchor'. Designed in Australia, the patented semi elastic GO-STRAP acts as a 'tie', and works in concert with the injured tendon and soft tissue, thereby carrying part of their load and releasing their tension. Protection from tennis elbow pain - at home - at work - at play. Staff at a leading major Australian University believe there is merit in this design, as it is very similar to a taping technique which they find effective for their tennis elbow patients. Controlled clinical trials on 34 participants found a 31% improvement in "mean" pain-free grip strength over that provided by the standard counterforce brace. However, the "standard deviation" of the data made the results "statistically insignificant" and follow up clinical tests are proposed. At the end of the study the participants were allowed to take home a brace of their choice. 21 (62%) chose the Go-strap. Grip strength testing of a trial group of 12 tennis elbow sufferers showed a dramatic improvement in pain-free grip strength, with an average strength increase provided by the go-strap being close to 3 times greater than that provided by the standard counterforce brace. Clinical tests in a small trial group showed a further increase in pain-free range of movement over that provided by the standard counterforce brace. A recent biomechanics preliminary study at one Australian University found a significant reduction in muscle activity in the protected region compared to a normal counterforce brace. The reduction of peak loads was higher than the reduction of average loads, indicating a surge or vibration damping effect. "Thanks for the fast delivery. I used the Gostrap at volleyball training and then in my game last Sunday and played absolutely pain free. It was very easy to fit and supported the injured tendon beautifully! It feels like I have a new elbow with no restriction at all. Now that you solved my problem, I'm willing to play tennis again as well, after suffering a bad injury playing in 2012. An ultrasound of my right elbow in June 2012 found 'Mild proximal common extensor tendinopathy' - classic tennis elbow. I'm so happy that after trying many straps finally I've found the one to play pain free. I would recommend the Gostrap to anyone with tennis elbow. Well done!" "I have used the GO-STRAP Tennis Elbow Support to great effect in the management of my own elbow pain and would certainly recommend its use to my patients. The one clear advantage I see in its design is that it attaches more securely to the limb providing greater support and stability particularly when using the arm." Andrew Gallagher, Physiotherapist / Myofascial Practitioner. "I have had epicondylitis for 18 months and play golf four times a week. I found the go-strap at Sportstek 3 months ago, and since then my injury has improved. This new curved design provides enhanced support and minimizes my pain." Peter Newman, former professional squash coach. "Supports the elbow very well throughout my shift." Lou Mandarano, dealer at Crown Casino. "Now its perfect - I can wear this support 24/7!" Mary Delaney, retired psychiatric nurse. "Wow - instant pain relief!" Josh Draper, baseball pitcher and cricketer. Chris Wilson, plumber and competition tennis player. The simple but effective design provides firm support in a large range of elbow positions using the advantages of the proven 'anchor' and 'tie' approach. The support is comfortable and flexible, in contrast to the disadvantages of skin irritation and elbow restriction which are the main problems with rigid sports tape. The concept is so simple its amazing no-one thought of it before! FITTING INSTRUCTIONS - please read carefully for maximum comfort and benefit - also look at Essential Video Tips. 1. Attach forearm strap around widest part of forearm approx 5-7 cm below point of elbow (picture 1). 2. Position buckle to align elastic GOSTRAP hanging smoothly just above point of elbow (picture 2). 3. 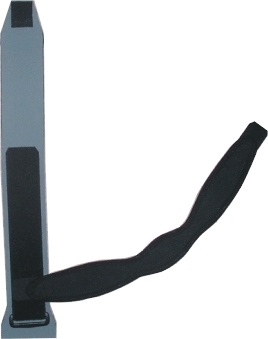 Stretch elastic GOSTRAP firmly around upper arm to provide desired support force (picture 3). 4. Wrap the GOSTRAP around forearm and attach to touch tape (picture 4). 5. Adjust either strap as required to optimize comfort and support. Stretching and strengthening exercises can be a useful part of the rehabilitation process because controlled loading improves collagen alignment of the tendon and stimulates collagen cross-linkage formation, which improves tensile strength. Ask your therapist to recommend some stretching and strengthening exercises, which should be done carefully several times a week as prescribed. For more exercise tips and fitting instruction video look at Essential Video Tips.